This Mobile Lifting Table provides for assembly and disassembly of the 50kg replacement screens without forklift or other lifting devies. After removing the collecting box or bin the lifting table is positioned under the cutting unit. The table is then lifted manually by operating the foot pedal until it sits directly under the screen. Fixation bolts of the screen can be loosened and removed and the table (with the screen sitting on it) can be lowered and pulled out of the machine. Installation can be done in reverse order. Use of a JBF Screen with a JBF Disintegrator means you can adapt your machine to different security standards and levels. A Screen's mesh aperture defines the granule size of the Disintegrator. To reduce the wear the screen surface is made from extremely wear resistant HARDOX material. This 14mm Screen is the smallest available screen for high secure applications and produces media particles complying wtih DIN Security Levels O3/T3/H5/E2. Practical throughput varies depending on the machine the screen is used with. Please check individual machine description for details. This 12mm Screen is the smallest available screen for high secure applications and produces media particles complying wtih DIN Security Levels O4/T4/H5/E3. This 10mm Screen is the smallest available screen for high secure applications and produces media particles complying wtih DIN Security Levels O4/T4/H5/E3. This 8mm Screen is the smallest available screen for ultra secure applications and produces media particles complying wtih DIN Security Levels O4/T4/H5/E3. This 6mm Screen is the smallest available screen for ultra secure applications and produces media particles complying wtih DIN Security Levels O4/T5/H5/E4 and is CPNI certified to shred hard drives. Feed Conveyor for use with JBF Media Shredder 38-50HD. 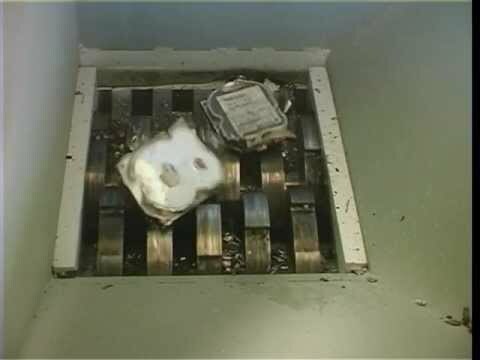 The Hard Drive Shredder JBF 38-50HD has been especially designed to completely destroy Hard Drives and Discs and other media initially to 30mm pieces, and then continue to grind down to as small as 6mm particles meeting the most stringent requirements for Secret and Top Secret Destruction. The JBF 38-50HD is a flexible Shredder/Disintigrator with various possibilities of feeding and exiting of all types of Media Products. It is designed for high throughput with a cutting zone of approx. 380 x 540 mm. The hard wearing knives continuously cut drives until the product is small enough to fall through a hardened granulation screen of a defined size for absolute security destruction. The JBF 38-50HD can be equipped with a variety of screen sizes (14mm, 12mm, 10mm, 8mm & 6mm - plus other sizes available) which can be interchanged using a forklift or optional Mobile Lifting Table. Exchanging the screen for one with smaller perforations means you can adapt the final shred size of the disintegrator in a few minutes. Please note only the 6mm screen is CPNI evaluated to shred hard drives to DIN Security Level H-5. The Shredding unit consists of a robust steel support frame, designed to accept a standard 120 litre wheelie bin with optional conveyor feed and exit available. Two slow revolving shafts offer low-noise and low wear, this low RPM eliminates the risk of spontaneous combustion. The cutting shafts can be individually changed and re-sharpened and the cutters are made of hard wearing hardened steel. The connection between shafts and knives is by means of extra strong multi-key latching and a split cutting block which allows the complete knife shafts to be lifted out of the housing for quick exchange. A High Torque 4kW motor is fitted as standard to run at 12 revolutions per minute to avoid sparking. Safety limit switches on the doors and hopper prevent any unauthorised operation of the shredder and each model features an Emergency Stop button. The 38-50HD Standard Unit is designed as a static destruction device with a 120 litre waste collection bin but it is also available as a mobile unit which can be mounted on a suitable vehicle (See JBF 38-54 HD Mobile Unit for more info). Warranty is 1 year in a one-shift operation or 2,000 working hours. Normal wear and tear of the knives and screens is excluded from the warranty.